Irish Oaks Savanna is a vast 40-acre wetland/savanna complex outside of Harvard. This site was listed by the Illinois Natural Area Inventory as the best remaining example of a dry-mesic oak savanna, and now it will be maintained and preserved forever! In this varied natural landscape, volunteers are needed to remove invasive species that prohibit the growth of native trees and plants. 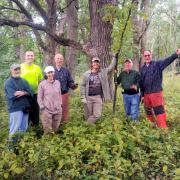 All year long we cut brush such as buckthorn, honeysuckle, and small willows with chainsaws and hand loppers. Volunteers can cut or help build and burn brush piles. No experience is necessary, so if you love being outside, come join our team of friendly volunteers! Tools and light refreshments are provided. Please dress in long pants, sturdy shoes and old clothing for working near a burn pile. Workdays at Irish Oaks Savanna take place the first Saturday of each month.